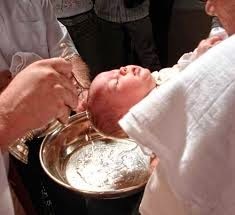 In the seminary we were taught to describe the various rites when we baptized babies. But we weren’t warned about what might happen if older siblings were attending. Not long after ordination, I did as I was told, and carefully explained that I was going to pour water on the baby, then anoint her, and then give her a candle. The baby’s big sister looked up at me anxiously. Just about an hour from now, I am going to baptize Avila Marie Ufford. I will do my best not to annoy her! Three years ago I married her parents, Natalie and Chris. A year and a half ago I baptized their first child Noah. And I have known both sets of grandparents for many years. So it’s fair to say that Avila might boast of her Catholic roots, if she were old enough. Yet an hour from now, even such a great family tree will be of secondary importance to this little one. Something else will matter still more: by water and the Holy Spirit she will receive the gift of new life from God, who is love. She will be welcomed into God’s holy people, called to live as a member of his body. Reborn in baptism, she will be called a child of God. But it adds something that’s crucial: “Since baptism is a covenant with God, the individual must say Yes to it.” YouCat even capitalizes the word Yes. When was the last time we thought seriously about this mystery—when was the last time we paused in wonder as we made the Sign of the Cross? Today’s a great day to stop and think about our belief in God as Trinity—one God in three Persons. First of all, we give thanks that God has revealed himself to us as Father, Son and Holy Spirit. This is not a truth we could have figured out for ourselves. Today’s liturgy shows that God revealed himself over time. In the first reading, God gives Moses the Law, revealing himself as merciful, kind and gracious, slow to anger, and abounding in love and faithfulness. But not as Trinity. The Gospel today reminds us that this isn’t just highbrow theology. If we’re celebrating the truth about God today, we’re celebrating the fact that God is love. And one of the ways we see this is through the doctrine of the Blessed Trinity. God isn’t solitary: he is the union in love of three Persons. The inner life of the Father, Son and Spirit is a life of love, love so great that it overflows and embraces each of us. This love is so great that it moved God to send his only Son to save sinners, to save those who would otherwise perish and be lost. Today’s Gospel puts the redeeming quality of the love of the Holy Trinity front and center. If we flip ahead to next year, the Gospel for Trinity Sunday recounts Christ’s commission to baptize “in the name of the Father and of the Son and of the Holy Spirit.” We heard that Gospel two weeks ago on the Ascension, so I’d like to end with a brief look at that command. If you want to know to whom you belong, ponder the Trinity. In this great revelation, we recognize God as our loving Father. In Jesus we recognize God as mercy see God as our merciful Lord. In the Holy Spirit, we welcome God’s own life into our hearts and know God as comforter and guide. These things are not dry or abstract theology. They are truths that make a difference to daily life. They help us to grow in faith, hope and love through the Spirit who has been poured out upon us and who, marvelously, dwells in our hearts together with the Father and the Son.